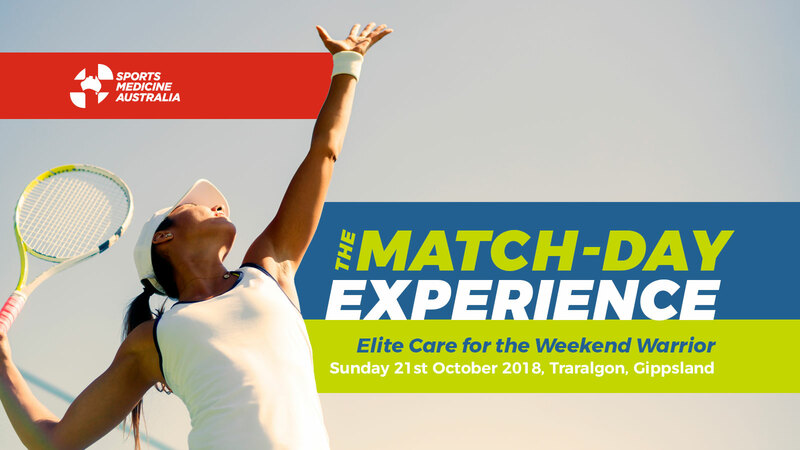 In October 2018, SMA hosted a day-long symposium ‘The Match Day Experience: Elite Care for The Weekend Warrior’ that focused on assisting in athletes’ performances. The day was divided into pre-game, during-game and post-game management of athletes, touching on some of the most important facets of sports medicine and how we can keep our athletes on the field and in good health. The pre-game session started with a presentation on load management by Doug Greenough, the strength and conditioning coach for the Dandenong Stingrays. Doug emphasized the acute to chronic workload as an easy and important way to make sure our athletes train enough but not too much. Following Doug, Simone Muscat, a physiotherapist working with the Carlton AFLW and VFLW, discussed the purpose of screening athletes (hint: it’s not to prevent injuries, it’s to get a baseline for your athlete). She stressed the importance of having a few quick screens done to your athletes every week, as a change in their baseline numbers could be putting them at risk of injury. Michelle Bergeron, a physiotherapist working for Ultimate Frisbee in Australia, continued with the topic of injury prevention by sharing prevention programs. This includes the FIFA 11+ and the Netball Knee. Michelle noted that these simple programs are available for free, and when followed correctly, can help reduce the risk of lower limb injuries up to 50%! Rounding out the morning was Liv Knowles, a PhD candidate at Deakin University, covering the importance of sleep. Though it’s often overlooked, sleep appears to be well and truly the most important aspect in athlete recovery – sleeping less than 8 hours per night puts athletes at a 1.7 x higher risk of injury! After the morning break, during game/on-field management of injuries was the next focus, and in particular, can you put an athlete back on the field after an injury? Our expert panel tried to help. Dr. Liam West, a sports physician registrar working with the Hawthorn AFL club, covered concussions. Long story short: if you’re on the sideline and you think an athlete has taken a hit, it’s best to take them off for the rest of the game (unless you have the luxury of a sports doc beside you who can do a full assessment). Keith De Souza, a physiotherapist for the Melbourne Uni Blues, reviewed ankle injuries and Tamika Fasoli, a physio with the Gippsland Power Football Club, covered the shoulder. Both stressed the importance of ‘look, move, feel’ when doing a quick on-field assessment, but also noted the difficulty in making a blanket statement on whether an athlete can play again, as there are many factors to take into consideration. Dr. Sibbon Fuzzard, a plastic surgery registrar who works with the Carlton VFL and VFLW clubs, covered hand injuries. Best to refer hand injuries onto hand specialists but pop your athlete into a volar splint first if you’re not sure. On-field management finished up with Dr. Bryn Savill, a sports physician registrar working with the Melbourne Rebels rugby club, covering bleeding and first aid. Make sure you always have gloves, gauze and tape on hand when you run onto the ground! The last part of the day covered the post-game management of our athletes. Isabella Russo, a PhD candidate at Monash University spoke about nutrition and hydration. No surprises here, but so-called recovery drinks (like Gatorade) aren’t that good for you and do little more than plain water. If you’re looking for a quick recovery shot, try some flavored milk or orange juice instead. Tass Amiridis, a sports chiropractor, reviewed the POLICE protocol (Protection, Optimal Loading, Ice, Compression and Elevation) for emergency treatment for acute injuries. It’s not much different than the old RICE protocol (Rest, Ice, Compression, and Elevation) that we know and love, except that it emphasizes Protection and Optimal Loading instead of Rest, which will help the athlete’s recovery time. Next up, Lirit Janover, a sports psychologist who works with the AFL Players Association, discussed the difficult task of helping our athletes handle defeat. Providing them with a safe and supportive environment is the first step in helping athletes navigate this hurdle. The last speaker of the day was Patrick Young, a physiotherapist who works with the Carlton VFL club. Pat talked about some of the clinical and on-field tests used to determine when an athlete is ready (or not ready!) to get back on the field. Every team / sport will use different tests, it’s important you have some consistent markers athletes need to achieve before getting on the field. In the end, The Match Day Experience was a succinct, informative day that inspired interesting questions and provided a great deal of clinical wisdom by the diverse set of speakers. To see highlights of this event and other SMA VIC events on Twitter, search our hashtag #VICSMA18. Follow us on Twitter by searching @SMA_News and @SMA_Events. Be sure to come along to our Running Symposium – ‘Run Like You Stole It: The Secrets to Injury Proofing Runners’ on Sunday 24th February.